Search Results for "portugal flag"
Lagos, Portugal - August 19, 2017: Portuguese bull mascotte with Portugal flag texture. In the historic center of Lagos, Praca de Gil Eanes. Summer season. Urban cityscape. Portugal flag is waving 3D animation. Symbol of European, Portugese national on fabric cloth 3D rendering in full perspective. 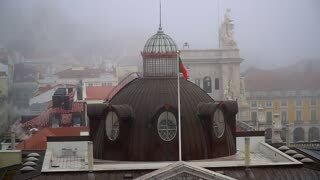 The Portugal flag waves in the wind in slow motion. portuguese bull mascotte with Portugal flag texture. Sport shop in the historic center of Lagos, Praca de Gil Eanes. Summer season. Urban cityscape. Portugal Flag in a Blue Sky. Use this clip loud and proud to express loyalty and love to our country. It is a seamless loop with luma channel. Panning from the Portugal flag to the bridge 25th de April.